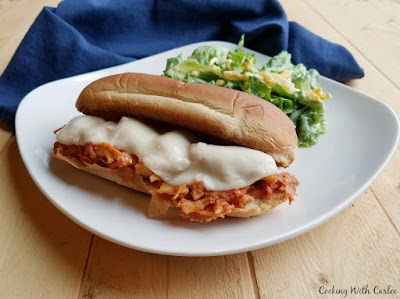 These chicken Parmesan sandwiches are a perfect busy night dinner. The chicken cooks in the slow cooker all day so all you have to do is shred and assemble when you get home! Happy Valentine's Day! I probably should be sharing something decadent and chocolatey with you. Or maybe something meatless to kick off Lent. 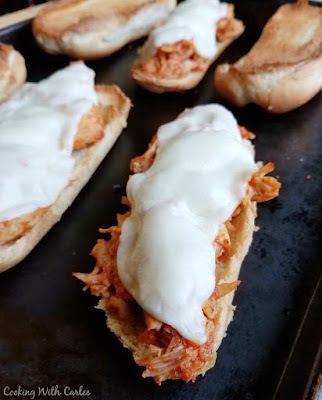 But I remade these chicken parmesan sandwiches recently and I couldn't hold out on you any longer! If you are abstaining from meat today, just put these on the menu for tomorrow! Or save them for the next busy day where you know everyone will be chasing their tails amd hungry for a tasty dinner. That is where the slow cooker comes in handy. It is nice to dump a few ingredients in the pot in the morning and come home to dinner almost ready. All you have to do when you get home is toast up the buns and shred the chicken. Top it with some provolone and stick it back in the oven for a minute and you'll have yourself a great meal. The buns are toasty, with that garlic butter goodness. The meat is tender and flavorful and of course melted cheese always makes things a bit better! These Italian flavors are always a hit with my gang. But if you would like something a bit different. I can suggest the tangy pulled chicken. 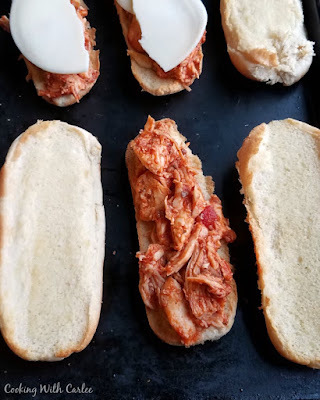 It is similar in that all you have to do when you get home is shred the chicken and assemble the sandwiches, but it is flavored with cranberries and BBQ for a sweet and tangy flavor bomb! Or perhaps a burrito bowl is what you have in mind. Then you should make the salsa chicken for sure! Oooooh, or honey sesame chicken! Now I'm hungry and want them all. Every time we have a good slow cooker dinner like this, it makes me wonder why I don't use it more often. I have a few ideas I want to try out soon. Hopefully they'll work out and I can share them with you. What are your favorite things to cook in the slow cooker? Season chicken breasts with salt and pepper and place in slow cooker. Pour sauce over chicken and sprinkle with garlic powder and oregano. Cook on low for 6-8 hours or high for 4. Preheat oven to 350 F. Place open buns, cut side up on a baking sheet. Melt butter and stir in garlic salt. Brush over bun faces. Place in oven and cook until lightly toasted, 5-10 minutes. Shred chicken with a couple of forks. Then mound on top of the bottom halves of the burger buns. Top with a slice of cheese and place back in the oven to melt the cheese, this should take only a couple of more minutes. It really is great for the summer. I have some honey sesame chicken going in the slow cooker now. Fingers crossed it turns out like I have envisioned! I hope you love the chicken parm sandwiches as much as we do! Hi Carlee, I love using the slow cooker to make dinner! I usually do soups. I have made chicken cacciatore in the crock pot too. I will try this out as it sounds so easy to make! Have a nice end to the week and weekend. Chicken cacciatore used to be one of my favorites. I haven't had it in forever. Now I really want some! Thanks, Julie! yummm, Looks great. I will surely give it a try. Thanks for sharing at freedom fridays. Have a great weekend! I hope you love them! It is nice when tasty and easy come together! How did I miss these? I think I might make them Sunday and have after graduation. Easy and everyone will love them plus it's something new for us from the amazing chef Carlee!! Have a great weekend!! You might have a thing or two going on this week! Have fun this weekend! Sounds perfect! And so easy... we love crock pot meals and this is one everyone would eat! Pinned. I hope you love it. It is definitely a hit at our house and great for those busy days! Thank you, it is an easy and delicious way to get dinner on the table! I love this recipe, it's perfect for a summer menu! I use my crockpot year round! Thanks for partying with us at Merry Monday. Thank you! I need to get better about using it year-round. It really is perfect for summer dinners too! 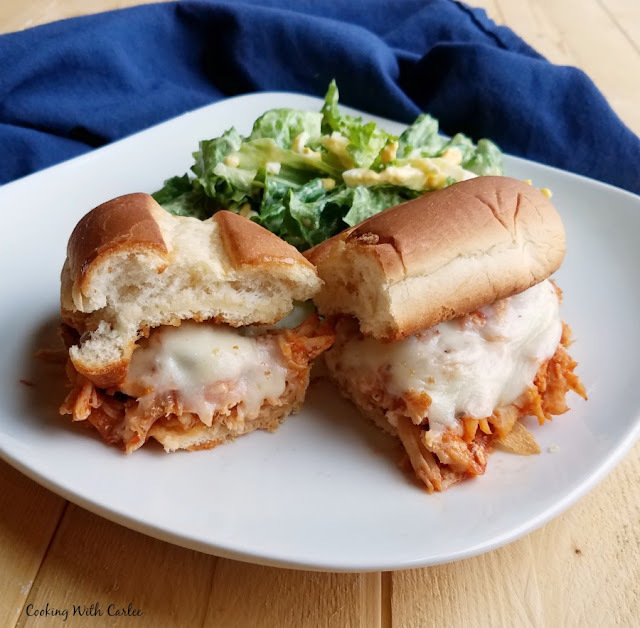 Great recipe Carlee, and good idea using the slow cooker. I think it save time and you don't have to heat up the kitchen!! Both wins in my book! Thanks! I made these ya know and they were a huge hit! The shredded chicken for them was brilliant! Happy Valentine’s Day! Hi Carlee, my slow cooker is rarely put away I use it so often. Saying that though I have never, ever cooked anything pullable in it and I do keep meaning to. Everytime I read one of your pulled meat recipes I think I must give that a go, but never quite get there... My favorite slow cooker meal has to be soup. The slow cooking brings out the flavours perfectly. One of these days you'll do it! I wish I could talk my husband into liking soup more, I love it but he could do without. If he enjoyed it, I would probably always have some perking on the counter during the winter too! This will be a great sandwich! Thanks so much for sharing your awesome post with us at Full Plate Thursday. Have a great week and come back soon! They're definitely a hit at our house, thank you! I could use one of these right now! They look and sound so tasty. I love the provolone cheese. Warm sandwiches are always so nice. I hope that you had a nice Valentine's day. This was a nice change to post. I posted a big heart of Fudge for Valentine's day, and right now a sandwich sounds better! These sound so great! Pinning to try soon! Thank you for sharing on Merry Monday! Hope to see ya next week!